The second leg of our upstream journey produced some lovely sunny weather. 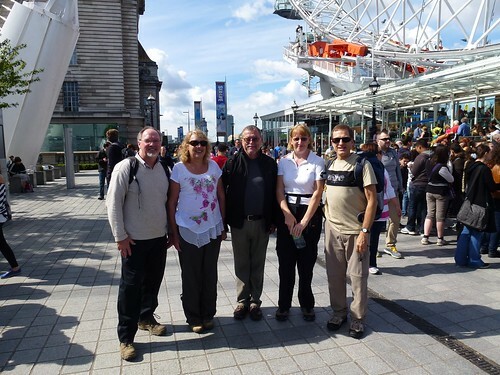 Alan, Andrea, Bill, Mary, Mark (me). One thing about walking through London is that you cannot move for historic buildings. 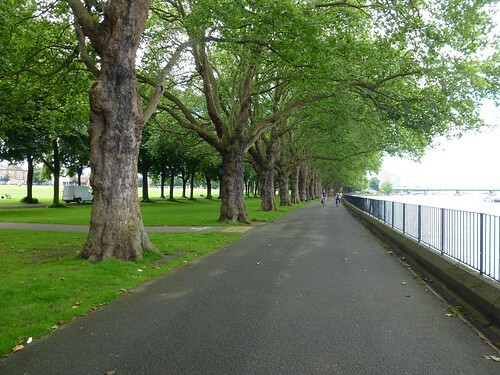 We passed through Battersea Park and Wandsworth Park which are Grade II listed parks. I knew buildings could be listed but it was news to me that parks could be as well. According to English Heritage there are 1,601 registered historic parks and gardens. 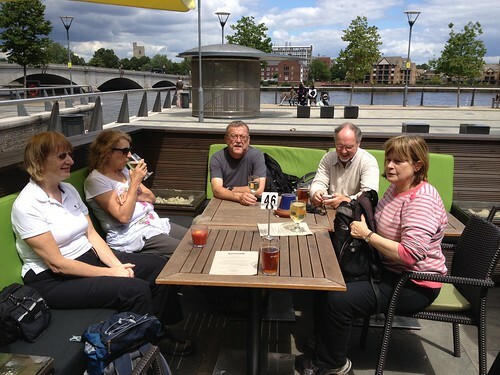 Lunch was at The Boathouse right by Putney Bridge where we joined by Ros for part of the afternoon segment. 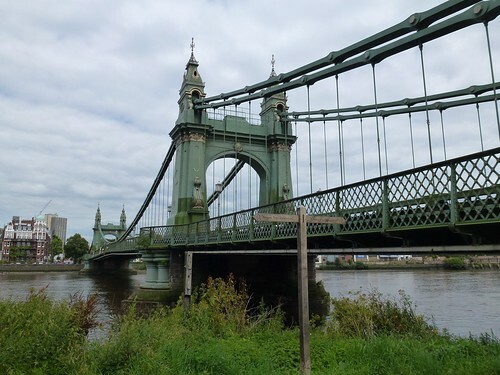 The remainder of the walk took us past the splendid Victorian engineering of Hammersmith Bridge designed by Joseph Bazalgette. We passed through Barnes and over the river to walk the north bank for a while. Then back over Chiswick bridge for the final stretch to our end point at Kew Bridge and the train home. 20120715-thames-path-02, a set on Flickr. 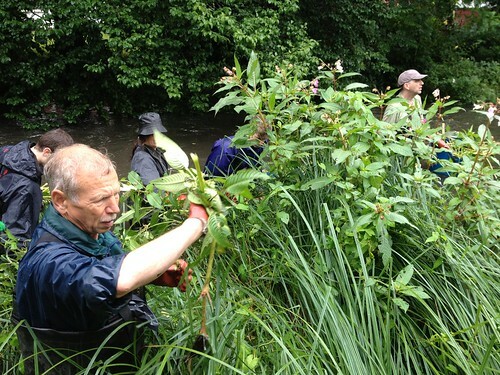 This month the venue was Beddington Park and the theme was Himalayan Balsam - an invasive species which smothers indigenous plants and causes river pollution through soil erosion. 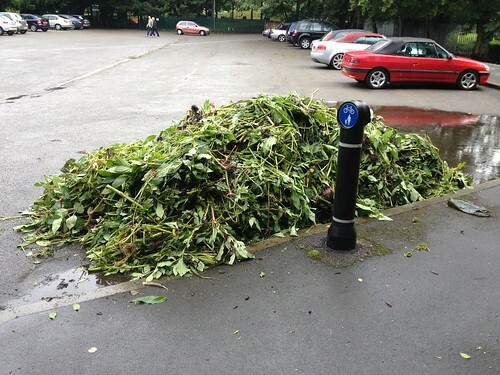 See the Managing invasive non-native plants booklet from The Environment Agency. 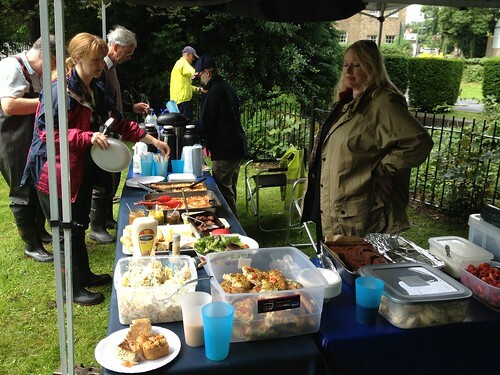 It was also the month for the annual picnic. It took me so long to cycle down from Wandsworth Town that all the waders were gone leaving only wellies and so I was, again, land based. 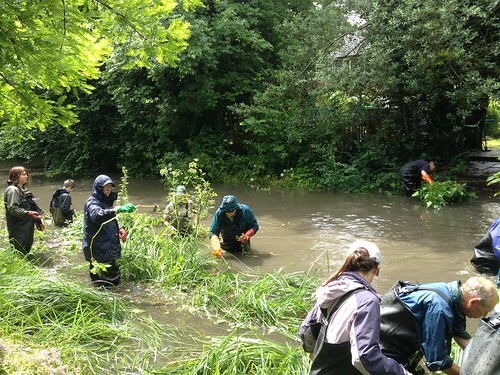 Given the recent rainfall the river was in full flood and, for a while, there was doubt as to whether anyone would be going in the water on safety grounds. In the end it was deemed safe enough so the waders harvested whilst I and the other bank-siders gathered up and carted away. 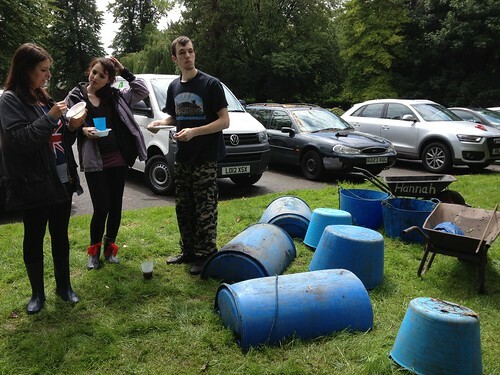 Much of the gathering was done using garden muck buckets and old, industrial plastic barrels cut in half and fitted with tow ropes. By the end we had a fair old pile of Himalayan Balsam and the river looked a lot clearer. As it was the annual picnic we worked a longer morning session and called it a day at one-thirty so we could have our picnic lunch. 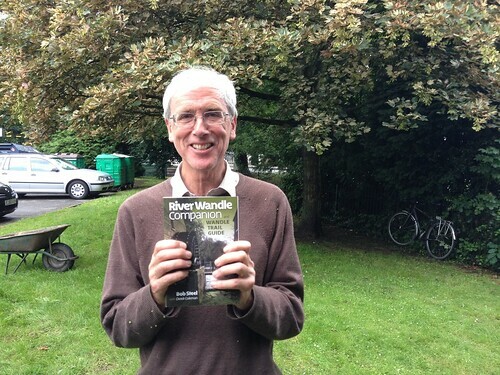 Amongst the volunteers was Derek Coleman co-author of the newly published "River Wandle Companion and Wandle Trail Guide" so I snapped up a copy and got it autographed. 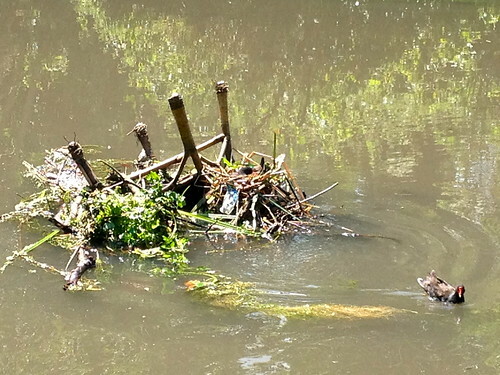 On the way back I was amused by a pair of nesting moorhens who had incorporated an old chair into their nest (or maybe it had washed up against their abode).